The Dropcam—now Nest Cam—seems to spawn a new competitor every week. D-Link—no stranger to the home security camera market—is the latest, introducing its Full HD Ultra-Wide View WiFi Camera (D-Link model DCS-2630L). The $200 DCS-2630L stands out with its wider-than-average viewing angle, advanced security settings, and lack of cloud-storage subscription fees. However, it’s hampered a bit by an anemic app that takes some of the facility out of mobile home monitoring. Even the smallest security cameras are difficult to hide in plain sight, but it’s nearly impossible to conceal the DCS-2630L. This is a big camera. It’s about the diameter of a drink coaster, and without its mount the camera weighs in at three-quarters of a pound. By comparison, the Nest Cam is less than half a pound. The D-link camera’s sturdiness is complemented by a nicely weighted stand that keeps it balanced even when you give the power cable a good tug, so you don’t have to worry about it toppling from whatever surface you place it on. The camera can also be mounted to a wall and it comes with a pair of screws. 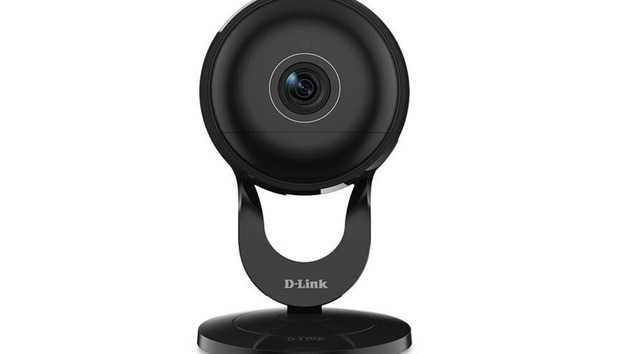 As D-link touts in the name, the camera has a generous 180-degree viewing angle—most cameras fall in the 130-degree range—and uses de-warping technology to reduce the image distortion that’s typical of such wide-angle lenses. It streams in 1080p and has six infrared LEDs to provide up to 16 feet of night vision. It also features a built-in microphone to pick up loud noises and to provide two-way audio communication. The latter is useful when you want to remotely talk to your kids or pets at home or even startle a burglar in the act. The DCS-2630L features a 180-degree viewing angle and can store up to 128GB of video on a microSD card. The camera can detect sound and motion, either of which will push an alert to your mobile device and trigger the camera to begin recording to an onboard microSD card (up to 128GB). There are pros and cons to this type of local storage: It saves you costly cloud storage fees and allows the camera to keep recording even if your Internet connection is interrupted. But if an intruder makes of with your camera as well as your valuables, you lose all video evidence of the crime. Setting up the DCS-2630L isn’t as turnkey as D-Link’s included “quick install” card would have you believe. Ostensibly, you just download the app, create an account, add the camera, and connect it to your Wi-Fi network. I’ve found setting up a Wi-Fi camera rarely goes that smoothly. In this case, the QR code wouldn’t scan, so I had to manually select the camera from an in-app product list. Connecting the camera to my network via its WPS button also failed. Instead I had to temporarily connect my phone to the network hosted by the camera, then reconnect to my home network. Once I got the camera connected, it required a firmware upgrade. Altogether, setup took about 45 minutes. Once up and running, the camera was streaming a live feed to my phone. The ultra-wide viewing angle took in my whole living room, and the image was clear in both regular and low-light modes. Despite the de-warping tech, there was still a bit of fish-eye distortion but it was restricted to the corners where it wouldn’t likely obscure faces or anything else in the main field of view. Motion detection settings include the ability to define detection areas and adjust sensor sensitivity. Though you can view the live feed and recorded videos in the MyDlink Lite mobile app, it gives you only limited camera controls. Beneath the feed window is a row of buttons for triggering the microphone, turning audio on and off, taking a screenshot of the feed, toggling the camera’s resolution between 720p and 1080p, and setting infrared activation to auto or manual. For virtually all the DCS-2630L’s advanced features, you must login into the MyDlink web portal. The browser-based control panel is divided into three tabs: Live View, which mirrors the main page of the mobile app and provides the feed; SD Card, where you can play back your recorded videos; and Settings. I discovered this last tab should actually have been my first stop, as this is where you enable and fine-tune detection settings. You can also define motion detection areas by drawing squares over a screenshot of the camera’s field of view. A slider beneath the image lets you adjust the senor’s sensitivity. For sound detection, you’re shown a graph with the current volume level in decibels; you move a level bar up or down to set the detection level you want. The DCS-2630L's sound-detection settings show you the current ambient noise level and let you adjust detection levels accordingly. As I have pets that are in the house even when the family isn’t, I limited the motion detection area to the door that leads from my living room to the backyard, and I set the sound detection several decibels above the baseline noise level. This significantly cut down on the number of false security alerts I received when I was away. The web portal includes a number of other features that are missing from the mobile app, including the ability to schedule recordings—critical if you want to plan recording around your household’s comings and goings—enable email notifications, and tell the camera to either stop recording or overwrite older videos when the microSD card fills up. D-Link’s DCS-2630L is a pretty attractive camera, with the kind of customizable security features we’ve seen in only a handful of models like the Simplicam and the Flir FX. It’s a bummer, though, that those features aren’t accessible through the mobile app. A big appeal of the DIY home security movement is having the means to monitor your abode at your fingertips no matter where you are. That’s significantly undermined if you need to log in to a website from a computer. Still, if you’re comfortable with those limitations, the DCS-2630L won’t disappoint.